This traditional Greek appetizer though is simple to make, it has great flavour. It is light and fresh, and it may also be used as a sauce for gyros or kebabs. Peel cucumber. Cut in half lengthwise and scrape out the seeds. Grate cucumber, place it in a sieve and sprinkle with salt. Let it rest for 5 minutes. With clean hands squeeze out excess liquid. Place in a small bowl. Add the yogurt, minced garlic, olive oil, chopped dill, mint and lemon juice. Stir until fully combined. Taste and adjust seasoning. Source: Adapted from CBC In the Kitchen. 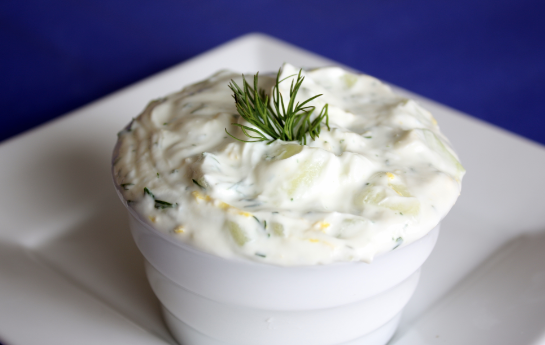 Categories: Cucumber | Tags: appetizer, dill, Greek, Greek yogurt, natural yogurt, sauces | Permalink. 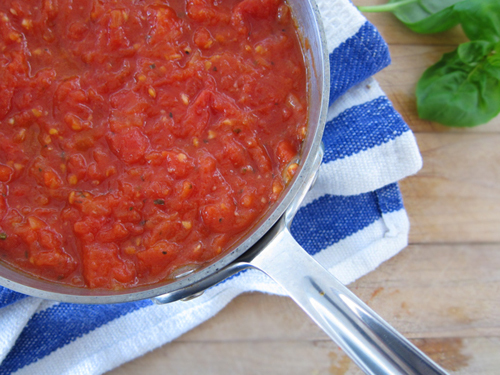 A recipe for this classic and basic sauce used for many dishes using our fresh hydroponic tomatoes. Pour the olive oil on a saucepan and heat on medium; dice the onion and put it on the pan. Finely chop the garlic cloves and add to the pan. Cook until onions become crystallized. Dice the tomatoes and place them on the pan; stir occasionally. Season with salt and pepper; sprinkle half the oregano and half the basil. When the tomatoes have cooked through, pour in the tomato purée; stir; when it starts simmering, pour the red wine (if you have at hand, no need to purchase a bottle unless you plan on using it for accompanying your meals). Sprinkle the other halves of oregano and basil. Taste and adjust seasoning if needed. Let it boil then turn off and set aside. Source: Slightly adapted from BBC Good Food. Categories: Recipes, Tomatoes | Tags: hydroponic vegetables, Italian, sauces | Permalink. Hello and Welcome to our recipes blog where we share with you some ideas on how to make use of our hydroponically grown vegetables and herbs to create main dishes or complement your meals! For our first recipe, we have selected a really simple one, where basil is our main ingredient; we are making Pesto Sauce. 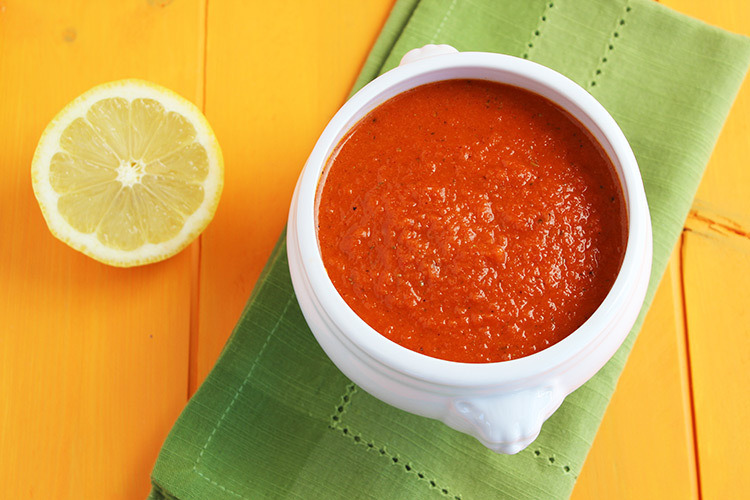 This sauce is one of the basics and is used in many ways: as an appetizer with bread, pita or crackers; as a dressing for pasta, pizza or spread for sandwiches, among others. 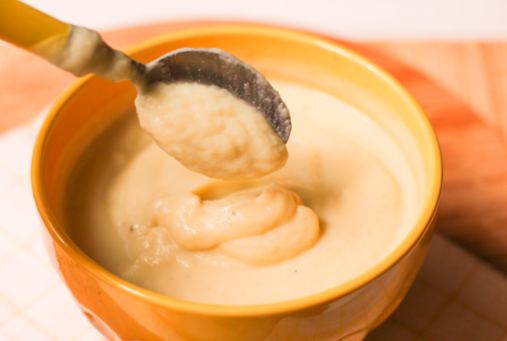 This recipe admits some changes depending on your budget or taste. For instance, some recipes call for pine nuts, but no worries, these can be substituted with walnuts. 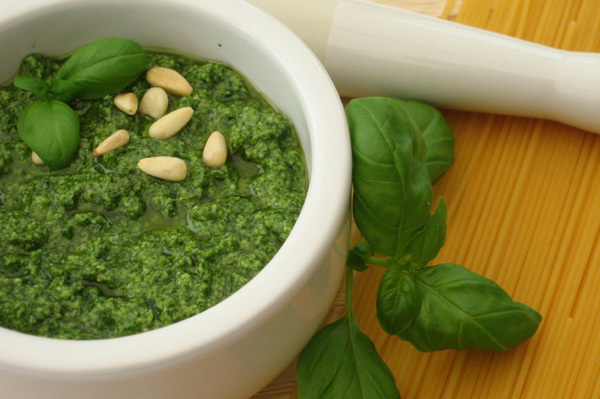 Some people dislike pesto sauce because they claim it is too oily. Well, even though it is part of the recipe, we are not keen on using large quantities of oil; therefore we have reduced it. If using pine nuts, place them on a frying pan over low heat until toasted (golden color), shaking occasionally. Transfer to food processor, add the basil and garlic and pulse until coarsely chopped. Drizzle the olive oil, add the cheese and pulse until well combined. Source: slightly adapted from Food Network. Categories: Basil, Recipes | Tags: pesto, sauces | Permalink.